Groomed L.A is Los Angeles’ go-to blog when it comes to health, fitness, lifestyle and beauty. The blog was first launched in 2008, and quickly gained a loyal following, and, in 2010, was named by Konector.com as one of the ‘Most Influential Beauty Blogs’. The ‘Groom’ section on the blog is where you will find everything beauty-related, from product reviews to how-to guides. 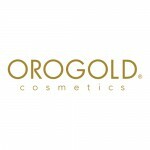 OROGOLD is extremely happy to see that one of Groomed L.A’s latest beauty posts is focussed entirely on OROGOLD’s holiday gift sets. 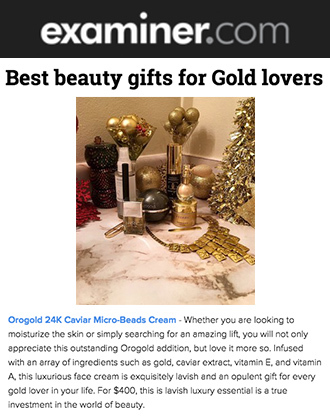 Titled “Put Gold in Her Stocking: With OROGOLD Ultra-Luxe Holiday Gift Sets”, the article highlights three of OROGOLD’s gift sets, each one containing three of our most popular products. The editor begins by stating how she already is a huge fan of OROGOLD, before moving on to beautifully showcase each of the three gift sets. The first gift set to be featured is the OROGOLD Box Package I, showcased on the blog with a product photo, price point, and a link to the OROGOLD website. The editor discusses the three products contained in this gift set, speaking of the benefits that they each bring; from the 24K Foaming Cleanser that “will remove excessive oils and impurities to enhance the natural glow of the skin”, to the 24K Salt Soufflé, which is “infused with rich ingredients” to effectively exfoliate and refresh the skin, to the 24K Deep Day Moisturizer Cream, described as being “delicate, yet effective”. 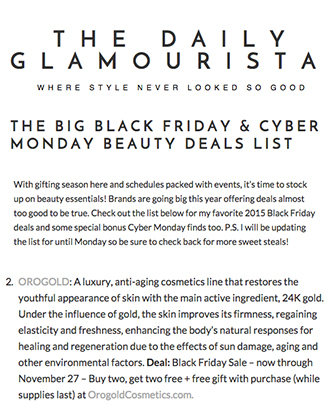 The next gift set mentioned in the article is the OROGOLD Box Package II. The editor speaks about how the 24K Milk Cleanser “is specially designed for delicate and sensitive skin”, while the 24K Deep Peeling “is infused with the finest ingredients to provide a powerful, yet gentle, facial cleanse”. The third product in this gift set is the 24K Body Cream, described as being “a non-greasy moisturizer, packed with essential vitamins and oils, [that] melts on skin contact leaving the skin feeling soft, smooth and delicately scented”. The final gift set to be featured in the post is the OROGOLD Box Package III, with the first product that it contains being the 24K Purifying Facial Toner, which has been “enriched with witch hazel and chamomile, both known for their soothing, calming and hydrating properties”. This gift set also contains the 24K Deep Renewal Night Cream, which “helps nourish the skin while you rest, so you can wake up to a softer, more radiant, complexion”, as well as the 24K Golden Body Butter, consisting of a “magnificent blend of 24 karat gold and shea butter”. 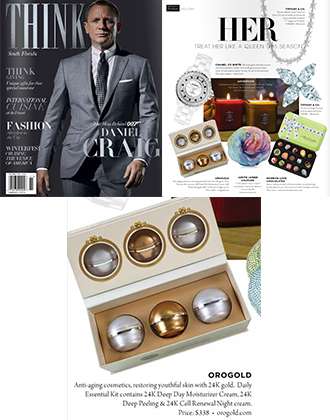 OROGOLD would like to thank Groomed L.A for this feature on our holiday gift sets. If you would like to know more about any of the products that have been mentioned, or would like to purchase a gift set for yourself or a loved one, you will be able to find more information on our website. Alternatively, you can also visit your nearest OROGOLD store for product demonstrations and guidance on which gift set to purchase.